Plextor� Corp., a leading developer and manufacturer of high-performance digital media equipment, today announced the PX-760A DVD�R/RW CD-R/RW drive. The multifunction internal drive is aimed at professionals and power PC users who require reliability, lightning-fast performance, and premium recording features. The PX-760A is a versatile DVD/CD burner that delivers state-of-the-art recording speeds of 18X DVD�R on certified 16X DVD�R media. Users can burn up to four hours of high-quality MPEG-2/DVD video on a single 8.5 GB disc using 10X DVD+R on Double-Layer media and 6X DVD-R on Dual Layer media. The drive also supports 8X DVD+RW and 6X DVD-RW Rewriting; 16X max DVD-Reading; and 48X CD-R Writing, 24X CD-RW Rewriting, and 48X max CD-Reading. DVD�VR is supported for direct disc recording, while DVD+RW background format eliminates the need to manually format a DVD+RW disc. The internal PX-760A drive features an E-IDE (ATAPI) interface for easy integration with Microsoft� Windows� 2000/XP-based PCs. A short drive length of 6.69 inches accommodates small form-factor PCs, while a replaceable beige front bezel allows a user to change the appearance of the drive to match a computer. The PX-760A has a 2 MB buffer and features Buffer Underrun Proof Technology to prevent buffer underrun errors and allow multi-tasking. 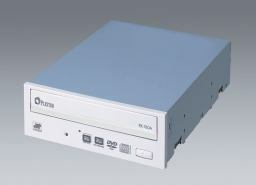 The PX-760A Series drive includes PlexTools� Professional software, a unique combination of user-controllable CD recording and CD/DVD media test features, including PlexEraser, Q-Check, GigaRec, SecureRecording, Silent Mode, and VariRec. Plextor’s bundled software package offers ease-of-use and extensive functionality for Windows platforms. The PX-760A drive ships with the award-winning Roxio� Easy Media Creator 7, Basic DVD Edition software suite for burning video, music, photos, and data to DVD or CD. The Plextor PX-760A drive will ship to distributors in North and South America in April 2006 with a Manufacturer’s Suggested Retail Price (MSRP) of $119.00 USD. All retail packages include one-year full warranty and unlimited toll-free technical support. Plextor Corp. is a leading developer and manufacturer of high-performance digital media equipment for professionals, consumers, and enterprises. Headquartered in Silicon Valley since 1990, Plextor has introduced generations of award-winning products, including digital video converters and CD-R/RW, DVD+R/RW, DVD�R/RW optical disk drives, and Network Attached Storage products. Plextor is privately owned by Shinano Kenshi Co., Ltd., a developer and manufacturer of advanced technology hardware and precision electronic equipment headquartered in Japan. Shinano Kenshi is best known for its expertise in manufacturing motors. Contact Plextor at www.plextor.com. Next post: Happy Valentines’s Day!!!! !